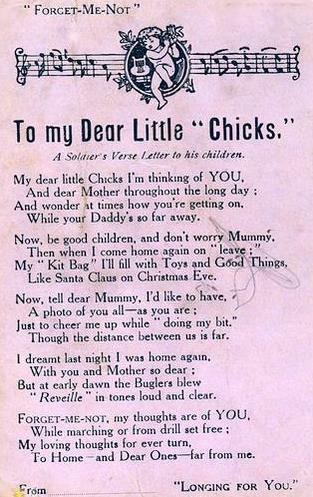 This lovely postcard sent from a soldier at Bulford Camp on Salisbury Plain, to his children in Sussex, shows the heartbreaking lyrics of a song from a soldier to his children. “FORGET-ME-NOT” is printed in the top left-hand corner of this pale-lilac-coloured postcard, which bears a pencilled scribble in the centre, while “LONGING FOR YOU.” appears in the bottom right-hand corner. While your Daddy’s so far away. Like Santa Claus on Christmas Eve. Though the distance between us is far. “Reveille” in tones loud and clear. ‘From ………….’ has been printed in the bottom left-hand corner, but the sender has not filled in his name. Just a line in hope it will find you all quite well as it leaves me to [sic] at present. What lovely weather we are having. Hope everything is going on all right at home do not be surprised [?] me come in at any time, I am still working in the cookhouse don’t seem to have any more news so will close with love from Charles’. A search of FreeBMD reveals that Charles Duke married May I. Drew in the June quarter of 1913 (Cuckfield 2b 329) – Cuckfield then being in Sussex, and now in West Sussex. Ancestry.co.uk indicates that they had two children: Eric C Duke, whose birth was registered in the July quarter of 1913 at East Grinstead (2b 239); and Winifred M Duke, whose birth was registered in the April quarter of 1915, again in East Grinstead (2b 209). These must have been the ‘Chicks’ whom he had in mind when sending this postcard, assuming that Winifred had been born before 26 April 1915.